This hedgehog was made using almonds, eggs, cream, sugar and then even more almonds. 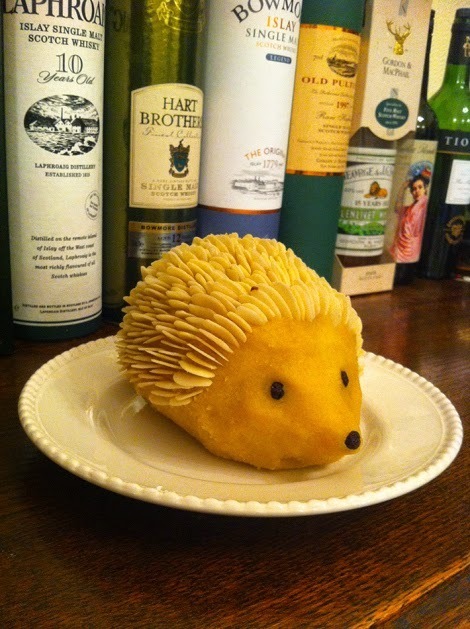 I was drawn to him, not just because I like hedgehogs, having found my first live one in the garden of the Japanese Consulate in Wellington NZ late one night back in 1973, but also because he was created using a recipe that was written all the way back in 1817. Think about that for a second. What that means is that even 200 years ago people were coming up with novelty treats and edible sculptures shaped like ridiculously cute animals. To make a Hedge Hog. It’s actually possible that this recipe is even older still. It may be a reprint from this 1747 source. So the next time you find yourself daydreaming about 18th/19th century banquets, as we know some of you sometimes do, don’t forget to include the ornamental, edible almond hedgehog.